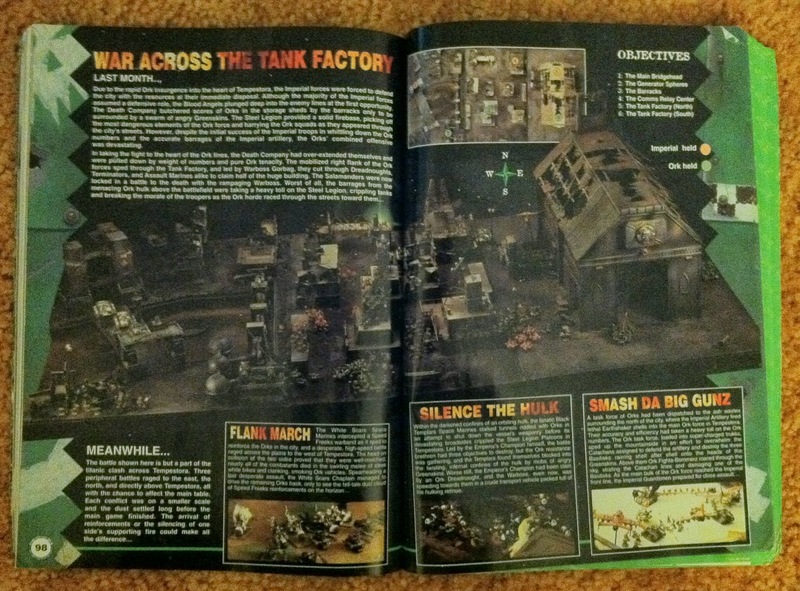 Mengel Miniatures: The Vault: My Very First White Dwarf! Welcome to a new feature on Mengel Miniatures: The Vault. Here I will be taking a nostalgic look back at some of the greater moments, models, books, and various other things from our hobby. 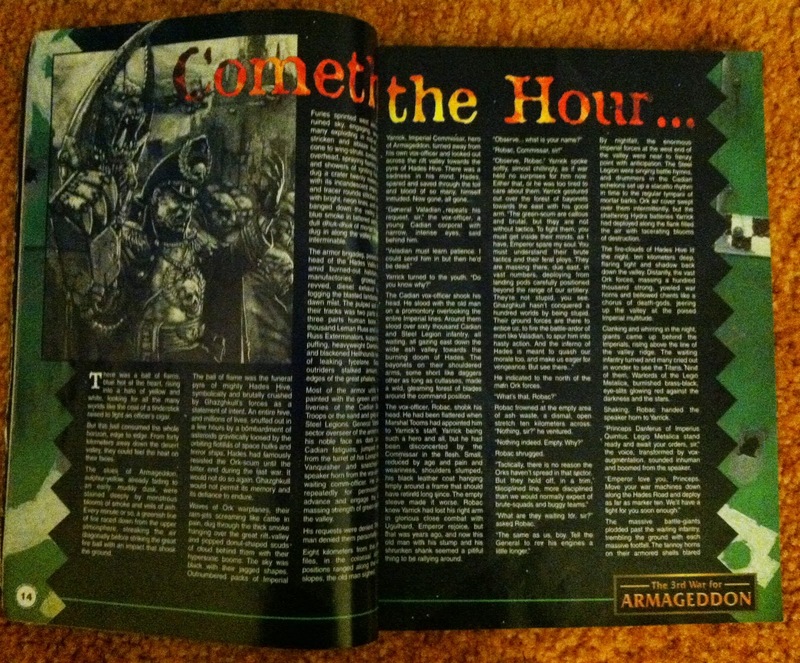 Today I start it off with a look back at my very first copy of White Dwarf from September, 2000. 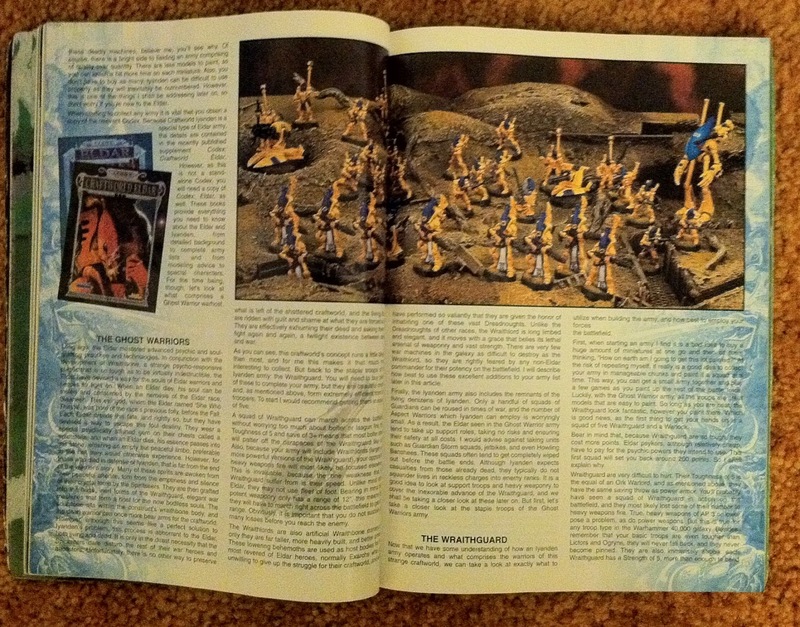 Let me set the scene for you, it was the summer of 2000 and my 11 year old self had just received the 3rd edition starter set of 40K for my birthday in June. I had walked into my local GW months before and was instantly taken with all of the awesome models I saw. I vividly remember going there with my friend and upon leaving saying how I was going to go back sometime soon and buy something, to which my friend responded, "No you won't," and I reluctantly agreed. I thought I probably wouldn't invest the time needed into it and it was just something I thought was cool and would forget within a day or two. Well here we are 14 years later and we can see how that turned out. When I cracked open my starter set after my birthday I rather enthusiastically started painting the Space Marines as Ultramarines since thats what the demo board at my store had. I recall gluing their shoulder pads on the wrong way and then having to tear them all off to fix it. Sometime within that summer I bought my second model, which I swear to this day was a Land Raider. There may have been some smaller purchase in between that I forgot, but I doubt it. This was a magical summer for 40K since the campaign for the 3rd War for Armageddon was raging across the world's GW stores. I never got enough models painted to participate in the campaign. My first game didn't come until later that fall, but that didn't stop me from hanging around my local store and watching the battles unfold. 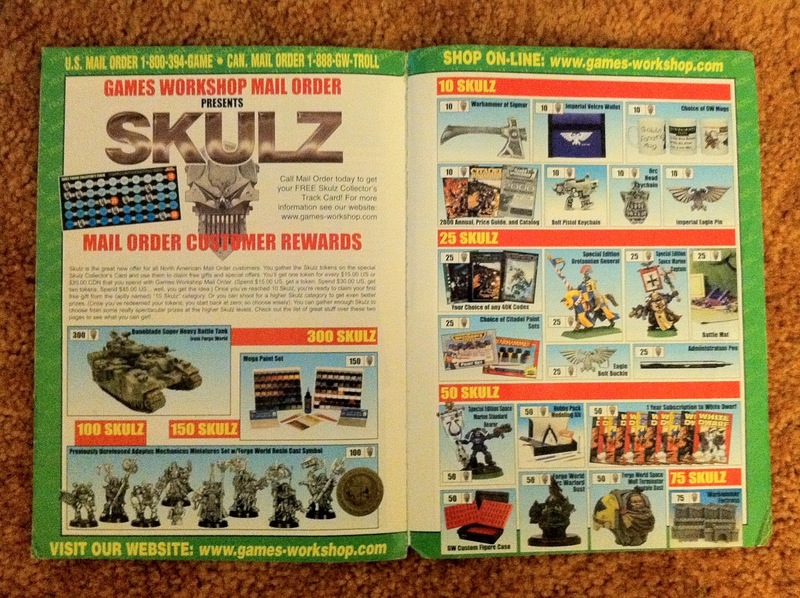 This is when I bought my first White Dwarf. Clearly it holds special meaning to me for nostalgic reasons, but it was also just a great issue packed full of content. Times were different back then. Third edition was still fairly new, the most recent codex was Craftworld Eldar, the Land Raider had just been redesigned, 6th edition Fantasy was still a month away, and I could buy a squad of Tactical Marines for $22.99. Well, enough with my reminiscing, let's take a look at issue 248 of White Dwarf. Check out that cheesy cover, I love it. The first thing you see when you open the issue are all of the new releases for that month. 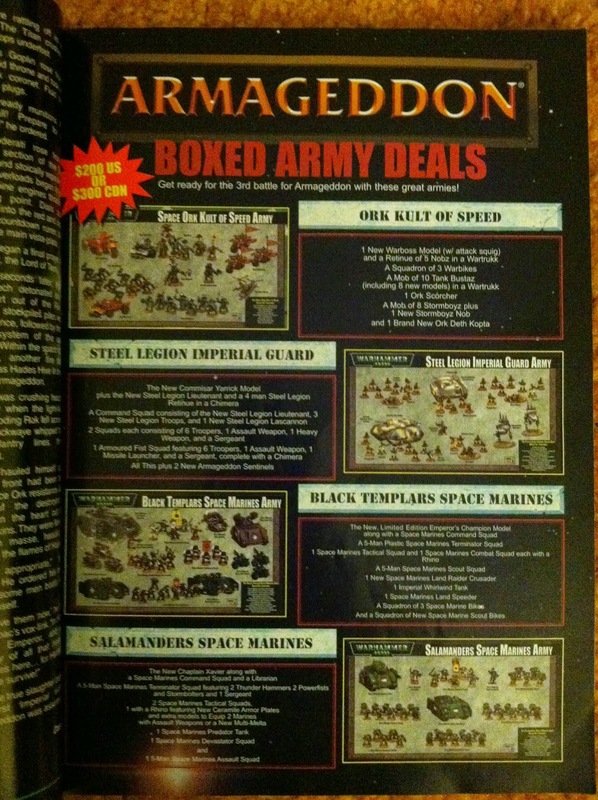 Like I said, this is when Armageddon was going on so the new releases consisted of Orks, Black Templars, Salamanders, and all of the new Steel Legion stuff, still some of my favorite Guard models around. They also do a brief recap of what the campaign is and include a battle result form so you can send in your own battles to influence the campaign. Following that is a five page short story written by none other then Dan Abnett. It sets up the start of the campaign and depicts the battle that raged around the still burning Hades Hive. We get some great moments with Commissar Yarrick, lots of Imperial Guard action, and a handful of Warlord Titans marching into an Ork Rok before blowing it to hell. It's great and still holds up today, the only thing that doesn't match current lore are the Warlord Princeps being in a command chair instead of an amniotic tank. After this are some new rules for Mordhiem and a hobby and tactica article on the, apparently brand new, plastic Sentinal model. 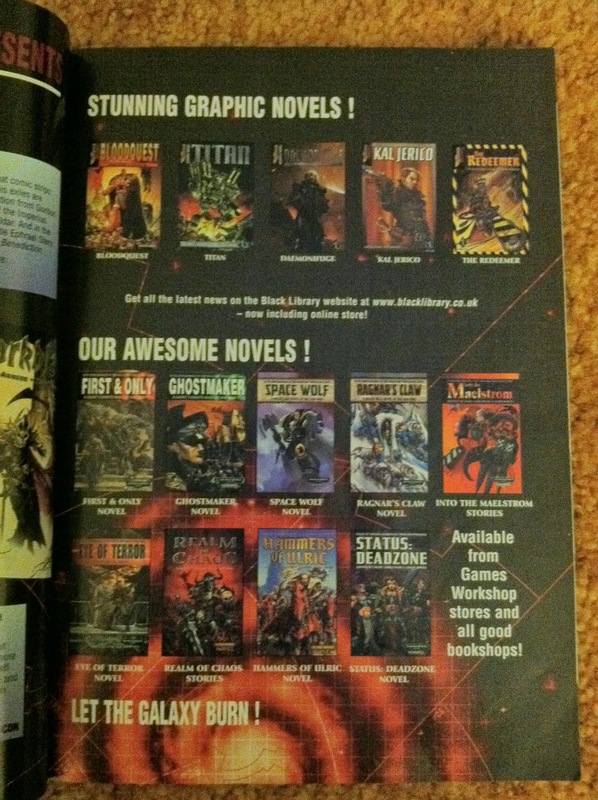 I thought this was funny, check out the whole nine novels from Black Library! Like I said, different times. Ragnar's Claw was my first step into the world of 40K fiction, I still have never read the first book in the series. There are a few pages talking about the new Land Raider Crusader including a copy of its rules since it was not in the Space Marine codex at the time. We then get another five pages of short stories about Land Raiders written by Gav Thorpe, Jervis Johnson, Andy Chambers, and Wiliam King! Seriously, this issue is about 75% short stories and lore, I love it. 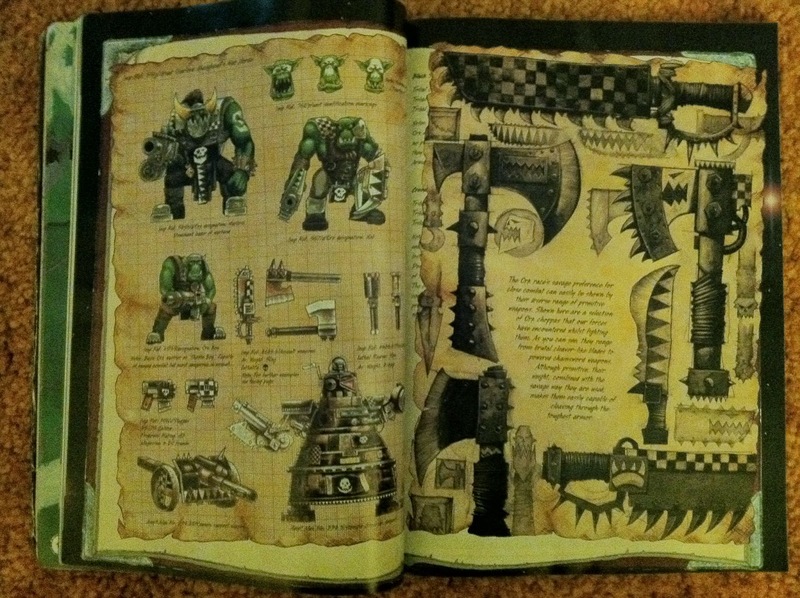 There are a few pages on the Orks, talking about them from an Inquisitor's perspective along with plenty of full color diagrams. Followed by four more pages of lore, this time on the new Eldar Craftworlds. There is a little bit of coverage of a Canadian Tournament after this with pictures of hobbyist's models. 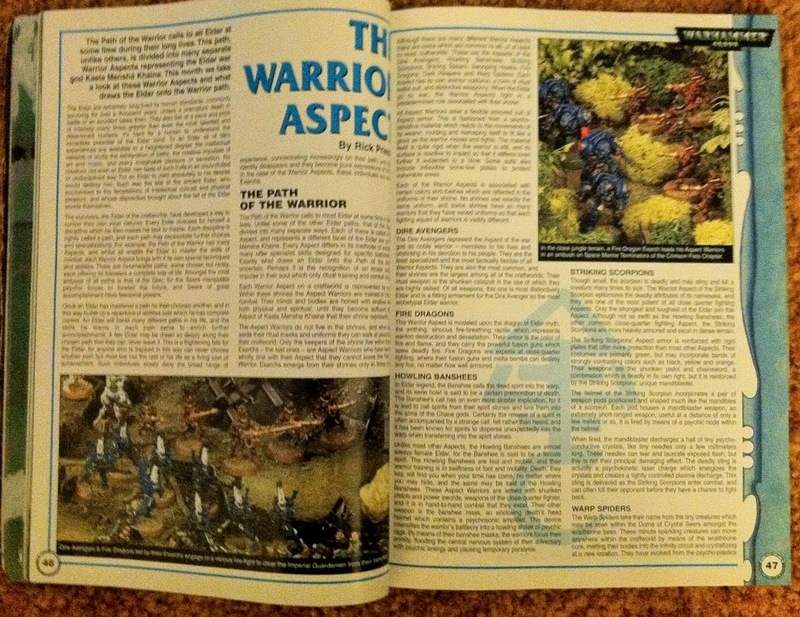 Then we get a fairly large article by Phil Kelly going over how to collect and play with an Iyanden Ghost Warrior army. I still love White Dwarf, but there is enough content in this one older issue to cover about a years worth of Weekly issues today. 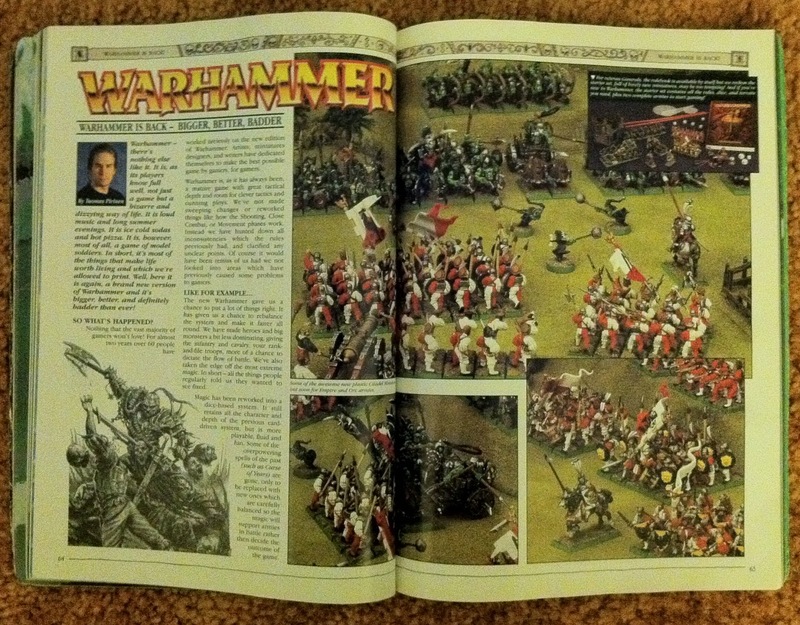 A sneak peak of the new and exciting 6th edition of Warhammer Fantasy. I really liked when they did these sneak peaks of upcoming releases a month or two ahead of time, it always got me really excited for what they were working on. 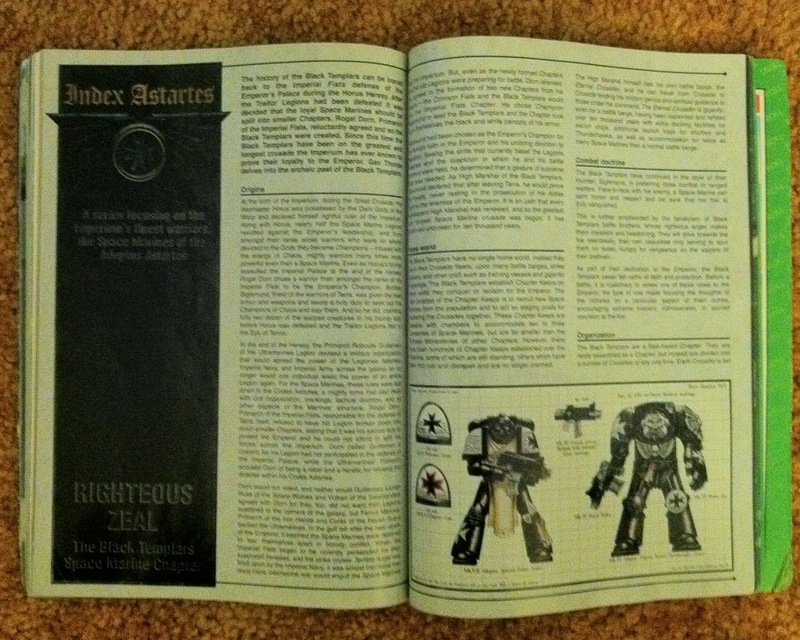 Do you remember the Index Astartes articles, the ones that basically solidified everything that acts as the ground work for all the current Space Marine lore? Well this issue had two of them in it. 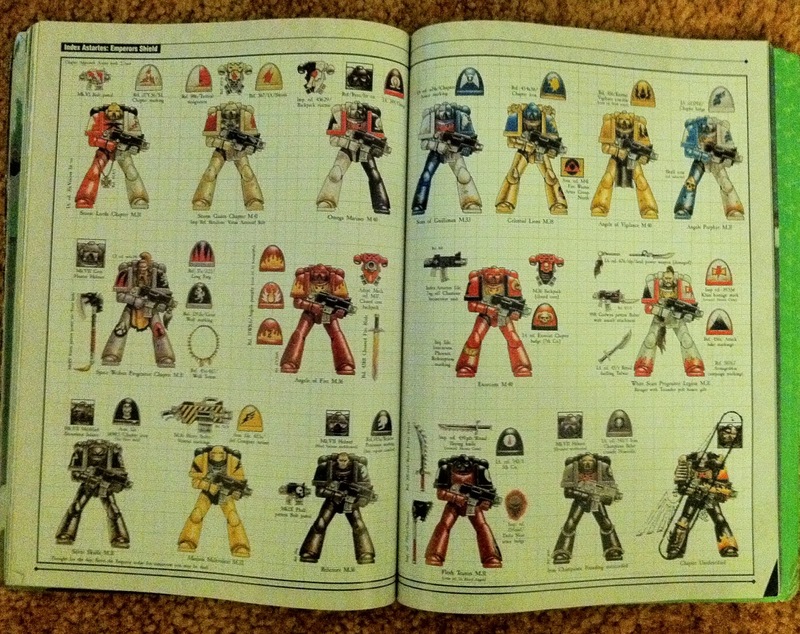 The first, which you can see above, briefly went over which Marine forces were active in the war for Armageddon and then had three full color pages depicting each Chapter's color scheme. The second went over the background for the Black Templars, which up until this point had just been normal Marines with a black and white scheme. From what I understand, a lot of what became the Black Templars' official look and feel actually came from Matt Hutson's personal army. So if you like their zealotry and crusader look you have him to thank. 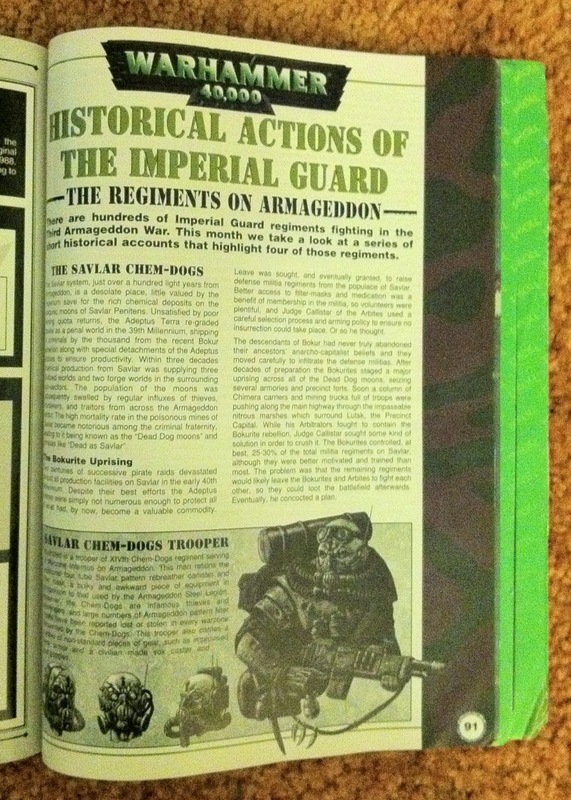 Another five pages of lore, this time talking about the various Imperial Guard regiments on Armageddon. In the picture above you can see the Salvar Chem-Dogs which I always liked, they just looked so cool. 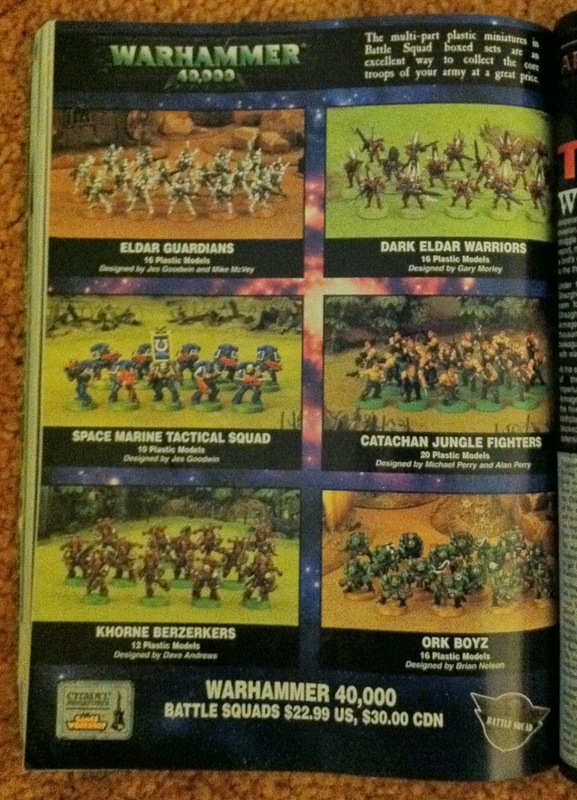 Behold, all six sets of GW's plastic 40k models at the time! The White Dwarf finished with an epic 22 page battle report which was four separate games all linked together. This was part 2 of it, sadly I never got to read part 1 from the previous issue, but I still devoured everything in this report. The whole thing is written in a historical narrative style, like how they write about important battles in the codexes, but with maps and pictures. There are a few bits of story scattered throughout, too, to help give it the feel of an actual short story. Then the whole thing finishes off with four pages of commentary from the players. Now that is how you do a Battle Report. I will just finish off this article with this picture. I always wanted the Mechanicus set but was never able to get enough Skulz.